Yes you read that right. 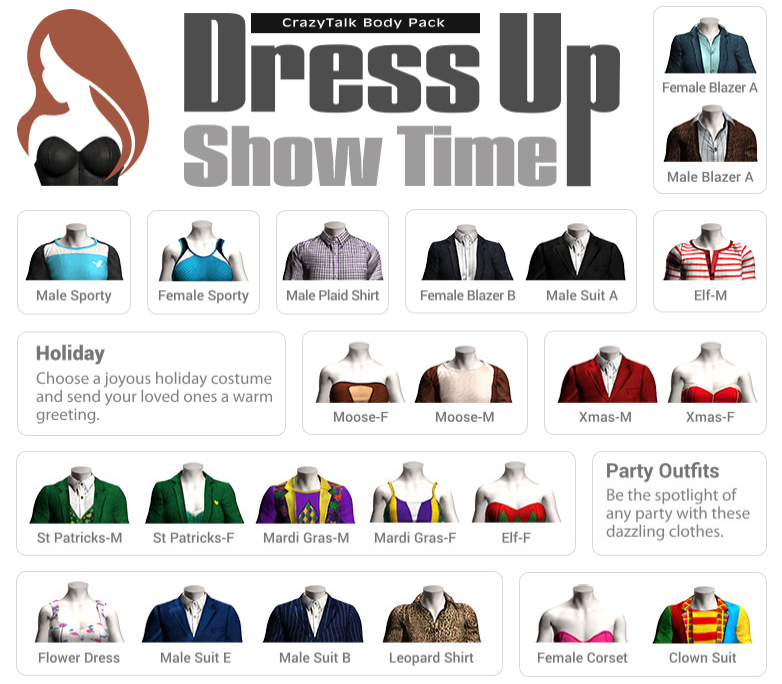 Share your CrazyTalk 8 3D Heads here and we will give you the "Dress Up - Showtime" Content Pack for just $1. All you need to do is post a video of your 3D Head created in CrazyTalk 8 and we will send you a purchase link for the Dress Up pack for $1. It's that simple. Please see below for more details. Step 1: Use CrazyTalk 8 to create your 3D Head. Step 2: Share your 3D Head video in this thread. Step 3: Take a screenshot of your 3D Head post and send it to "webinar@reallusion.com"
Step 4: You will then receive the "Dress Up" Content Pack purchase link for $1 in 1-2 working day. * Join the upcoming webinar "Easy to create a Talking Avatar with CrazyTalk 8"
I don't want the pack (only use CT for creating 3D heads) but I thought I'd share this quick thing I did just now of Sterling Archer (inspired by a video of a Brit gal who did a great iClone tutorials on doing 2D in iClone which I *must* try for myself one day). This points out, BTW, how we REALLY need more male hair (because where this falls down is the hair -- oh, RL, bring us that hair pack ASAP. And let it have tons of just "normal" male hair styles, as Sterling just has the standard wavy men's hair look that should have been included with Character Creator from the very beginning). I have no personal problems sharing that link, but yesterday for the first time I looked at it and it was marked private and asked not to share indiscriminately. So I'm going to give it to you via PM (no offense to others here, but I would be betraying her if I did otherwise. Others can PM me if they also want the link but putting it on this open forum would just not be right). Yesterday I began to study the program. It turns out not quite what I would like. But I will try and hope that I will get better results. It is a pity that the choice of hair and clothes is very poor, then as a huge amount of accessories for parties. I think I already have the showtime pack. I agree about the hair. We need more hair and normal hair would you think be standard. Women's hair also very limited but male hair even more so. Don't understand how RL can give us clown suits but not ordinary hair styles!? Male hair is the weakness of ALL the RL product line -- we are missing the six basic male hair styles in iClone as well. They ought to just release a pack for their entire line for those styles. I know they have more hair in the works, but who knows what styles it will be? (Most likely some more punk or extreme styles that NO ONE would ever use).